God didn't create us to go through life alone. He created us to be relational. He created us to do life together. We can all recognize that depending on how we're wired, we may need varying levels and quantities of relationship interaction. For instance, if you're an introverted person then you'll typically need less than an extroverted person but the same truth remains that we were create for relationship beginning with a growing relationship with God as well as with others. We're meant to pour into one another. Build one another up and in a sense - be fuel for one another. While it's true that ultimately God is our true source of strength, hope and more through His Son Jesus and the Holy Spirit's work in our lives, God also gave us one another as we're to do this thing called life together because we need each other. We all have low days and great days and to have a friend or friends and loved ones to walk your journey with you is an amazing gift! You can think of it like a car and we all know that to move down the road, the car needs fuel as well as regular maintenance to run well. When your car gets low on fuel...or is maybe on fumes...what do you do? You drive or push your car to a gas station and fill up again. In the same sense, your relationship with God through Jesus, God's Word, the Holy Spirit and also the relationships with your friends and family - are the fuel you really need each day. Let's say that you and I are friends and you're low on fuel (emotional, physical and mental fuel), and I have more than enough that day or at least a little extra, so I help fuel you when you are low...and vice versa. That is how relationships work or should work. You pray them. You encourage them. You check on them. You laugh with them. You speak truth in love to them. You make sure that they are truly OK when they say that they are "OK" You might bring them a meal when they are frazzled or maybe when they are sick. You do many things beyond this list when you are friends and prayerfully they reciprocate. 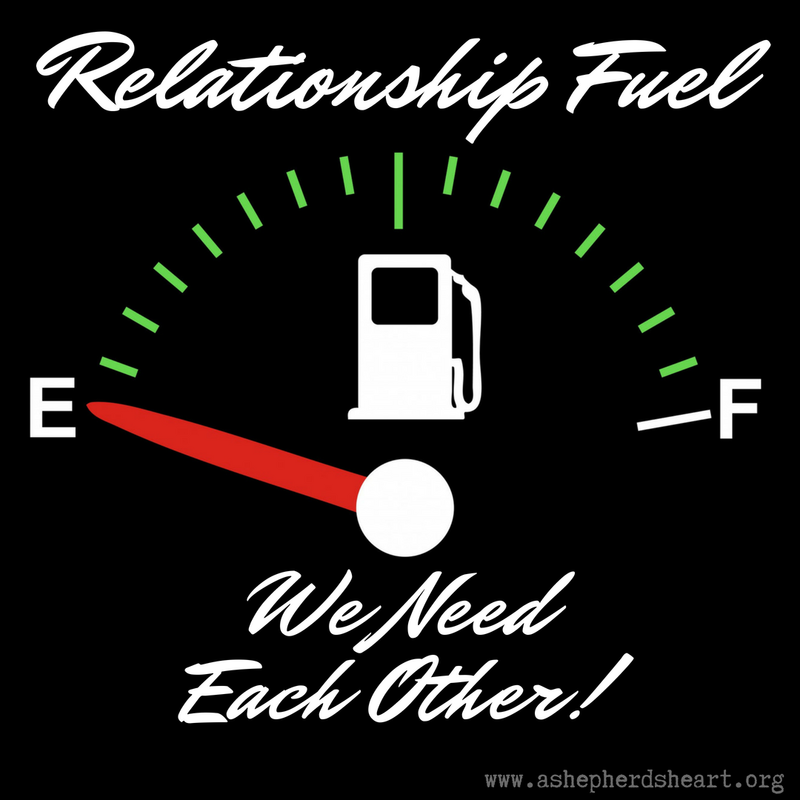 All these and more are examples of relationship fuel....ways we fill each other's tanks. This list barely scratches the surface and this doesn't even touch on all God does to fill our tanks daily! God is good...and knows what we need and we need Him and others to keep our tanks full. I have to say, I don't know how I would have made it through the many hard and or dark times I've faced...times of depression and sickness without God's help and the help of other's (loved ones and friends) who helped lift me up and some cases literally pulling me out of my own pit of despair! At the end of the day, I hope your tank remains full and gets refilled on a regular basis along the way. I pray that it especially is refilled and remains full through and in your relationship with The Lord and the power of The Holy Spirit! 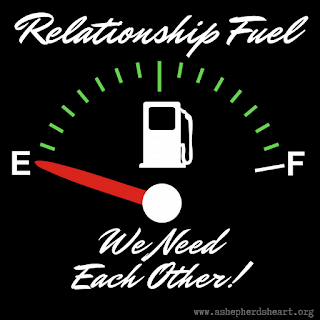 I also pray that you help be the fuel for others when they need it on an ongoing basis and that you ask for fuel when you need it yourself as you can't move very far when your tank is empty or literally on fumes and neither can they! P.S. I'm reissuing this post 06/2018 as God brought the importance of relationships to mind again and believe this encouragement will helpful to whomever reads this.